Kompatibilität: Benötigt iOS 5.0 oder neuer. 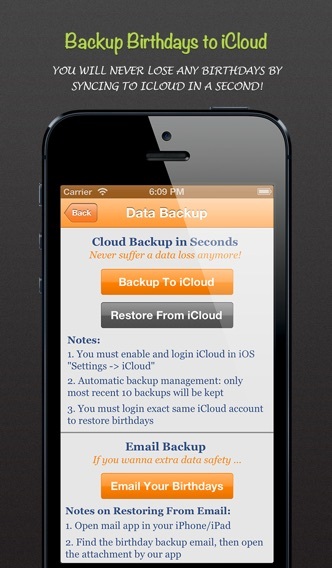 The best, cleanest and most powerful Birthday Calendar / Reminder / Countdown app on the App Store, NOW FREE! Ever wish you had all birthdays in one place? Here's your chance. Birthday Sweet will help you track all those special days in your life. With this app you’ll never forget any birthdays! It's FREE but beats most paid apps of the same kind because: -You can import all your friends’ birthdays from Facebook and from iPhone contacts in seconds! - Gracefully displays which friends' birthdays are coming up, how old they will be and the days remaining until birthdays (with age, photo and zodiac!) 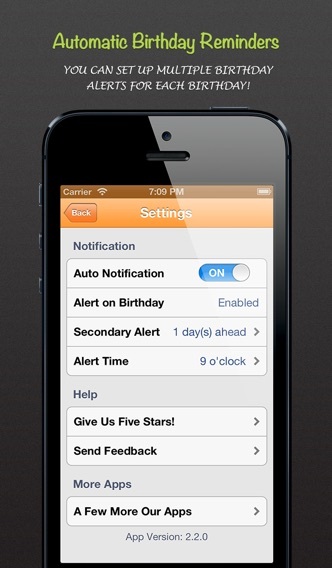 - Configure alarms and the time when you will be alerted for the upcoming birthdays - Easily message your friends and wish them "Happy Birthday" along with custom message with just one click! - It's never been easier to send a happy birthday greeting card: you can personalize and send a beautiful retina-quality eCard in just two clicks! 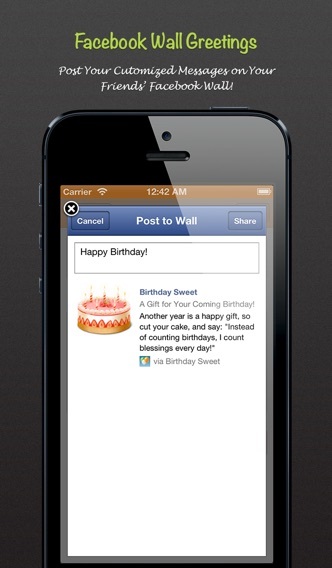 - Post birthday greetings and the stylish birthday cards to your friend’s FB Wall! - Support large data set: you can create and save as many events/days as possible! No performance loss! - Support Chinese calendar (lunar calendar) EXAMPLE USES: - Get reminders for friends’ Birthdays and family Birthdays and send them awesome eCards on Facebook - Send a greeting/happy birthday card to your wife, children or best friends - Impress your friends and family with beautiful birthday cards and greeting cards sent directly from your iPhone WHAT OUR CUSTOMERS SAY EVERYDAY: ★★★★★ Mar 29, 2012 by Gus'smom Cheap & Easy! - I honestly wouldn't change ONE thing~This free app is exactly what I was looking for~ so easy & convenient... Took only a few minutes to sync over 500 birthdays from Facebook... I am impressed with this awesome little app! ★★★★★ Nov 20, 2011 by Cezmae Great app - I love this app. I'm able to store all of the birthdays of the people i love in one place. Great app and good integration with fb too. But i hope they will give us notification without opening the app first so we wont totally forget it. ★★★★★ Nov 15, 2011 by Bootaful Reminders, if anyone needs them its me! - I’m so forgetful and I struggle to stay organized and keep up with life; keep my agenda/calendar, list of to-do's up to date. Be present in life and for my obligations. This app helps to remind me to, slow down, remember and celebrate all the people I love in my life. I'm dealing with a horrible disease, life is so crazy and painful. Every chance I get to stop and remind those special people I don't get the opportunity to see that much anymore, just how much they mean to me. Also reminds me to count my blessings, be grateful. And just break to Pray. Thank You, I Love this App! I miss the new update since a very long time. All my Birthdays are not available anymore. This App doesn‘t work with IOS 11😠 Make some Updates asap!!! I need an update. Please. Läuft nicht mit ios11!!! Sobald Update da ist gerne wieder eine bessere Bewertung! Momentan kann ich auf KEINEN EINZIGEN Geburtstag schauen! One of my favourite apps in IOS10. But with new IOS11 no apps will be supported with 32bit :-( Please fix the app! Ist eigentlich eine super App, aber seit iOS 11 funktioniert die App nicht mehr! Und das schlimmste ist: Ich komme damit nicht mehr an die Geburtstagsdaten, die ich direkt eingegeben habe! Wenn die App aktualisiert ist gibt es sich wieder mehr Sterne! Bitte aktualisieren, kann die App leider unter IOS 11 nicht mehr nutzen. Funktioniert nicht bei iOS 11! Bitte aktualisieren! Die App ist wirklich sehr nützlich gewesen.. Bis iOS 11.. Bitte aktualisieren!!! Ich finde diese App super, nur leider kann ich sie nach dem Update auf iOS11 nicht mehr verwenden. Bitte stellt ein Update für diese Version bereit. Eigentlich ganz gut, nur Jahreszahlen nicht lesbar, da Feld zu klein. Daher unbrauchbar, im Alter auszurechnen. Schade!